Dublin’s a big old place — with so much to see and do, you’ll want to make the most of every moment on your visit. 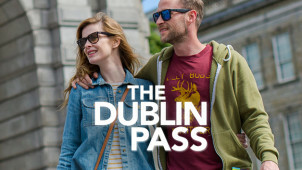 That’s where Dublin Pass comes in, an all purpose ticket for the best attractions and museums; think of it as an all access pass to the city itself! Just one ticket will get you entry to 30 top attractions as well as 20 deals and discounts in establishments across the capital. You’ll be able to experience a hop on hop off bus tour, fast track entry into the busiest museums and even receive a free guidebook to help you plan your stay. With a range of durations from 1-5 days, Dublin Pass has you covered for day trips and long weekends alike! You’ll be able to enter the likes of the EPIC Irish Immigration Museum and see the stories of Irish men and women who’ve journeyed around the world to find a new home. Then there’s the Jeanie Johnston Tallship & Famine Musuem that tells the story of the Famine and the 19th century sailing industry. Not forgetting the various distilleries and storehouses from Teelings, Guinness, Jameson and beyond that continue to provide Dublin with the finest quality drink. Whatever you’re interested in, the Dublin Pass will have something for you! How do I use my Dublin Pass promo code? Get social on Dublin Pass’ Facebook page to hear about the latest offers and more! Does Dublin Pass do special offers? Yes, check out the offers page here. Are Dublin Pass attractions open all year round? Most are open all year with just a few days of closure, usually around the christmas period. See the attractions section for more details. Can I get a Dublin Pass discount for students? Unfortunately not, but the adult ticket is designed to be excellent value anyway! Can I buy the Dublin Pass for a group? There are no restrictions on how many you can buy, though be aware that groups of 10 or more may be refused entry at some attractions. We advise contacting attractions in advance if you are in a group of over 10 people! If you’re planning a trip to the capital you’ll want to check out the Dublin Pass. The best way to see everything Dublin has to offer without blowing your budget, you’ll get access to Dublin Castle, Dublin Zoo, the Guinness Storehouse and much more all on one ticket. Buy with a Dublin Pass discount from vouchercloud and you could get yourself a fantastic saving worth shouting about — discover our capital for less today! What do Dracula author Bram Stoker, actor Colin Farrell and singer Sinéad O’Connor all have in common? Their careers all began in Dublin! This city has a cultural history that has produced world renowned artists, from Oscar Wilde to U2 and the Boomtown Rats. Come and walk its streets, experience its galleries and concert halls and soak up the atmosphere of a city that has changed the world in so many ways! If you want to give yourself a chance of seeing everything, we’d highly recommend the 5 Day Dublin Pass. This’ll give you access to the very best museums, attractions and sites Dublin has to offer, with plenty of time to take everything in. Purchase with a Dublin Pass voucher from vouchercloud and you’re sure to save money on your trip, meaning you’ll have more to spend on sampling some of that famous Dublin whiskey!